Google Drive is your readily available cloud storage space. You can store your documents, photos, etc. and retrieve them – from anywhere there’s an Internet connection. This free collection of programs lets you or your students write papers, collaborate on homework, create a slideshow. 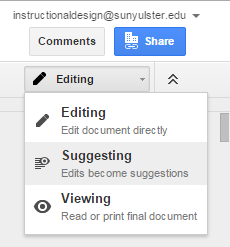 When editing a document in Google Docs, your edits automatically save over the original document as plain text. "Editing" mode is how you write or change the document directly. Then you can add text and it will be saved as a sort of "comment" which is automatically highlighted, instead of saving as plain black text in the original document. If you like your edit and want to incorporate it completely into the document for the final product, you just have to click the little check mark next to the edit to "accept suggestion" (or, if you don't like it, click the X to reject it).